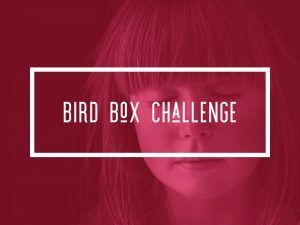 There is a big buzz around Bird Box and a large following of teens wanting to test their boundaries. If you have not seen the thriller movie, it’s about a darkness that takes over the world, the only way to not see the darkness and commit suicide is for you to stay blindfolded when you step outside. Teens are taking the movie to a whole new level. There has been reports of teens daring each other to do dangerous acts blindfolded. Each dare surpasses the last challenge. The latest report was a teen driving their car blindfolded. This is where we have a call to action and need to talk to our students and children. Explain the danger of driving blindfolded and ask teens to visualize what can happen. Run a simulation: Have students imagine how they would feel if they got hit by a car or someone they loved got injured or died because of this challenge. Have them close their eyes and imagine as you walk them through the situation. Turn the situation around and have them imagine if they hurt someone: Add in dangerous scenarios such as a pedestrian walking across the street or missing a red light. Then have them talk through how it would feel to hurt someone else, to hit a child or mom and baby crossing the street. You can show different car accidents from being distracted or texting. Make the connection that when we can’t see the road we are endangering ourselves, our loved ones, and people around us. Have a discussion of peer pressure and dares. Run through how to overcome peer pressure and say no to dares. Talk about the consequences of dangerous actions. Explain that it can impact them for the rest of their lives. Pull from stories of pranks gone wrong or hazing situations. Teens can severely hurt themselves, loose scholarships, get denied from colleges, and create a negative social image that will follow them for the rest of their lives. Talk about how the brain operates and often teens take more risks without thinking of the long-term impact. Then turn it back on them to identify how this challenge could negatively impact their lives. Talk about the impact of being under the influence and doing the Bird Box Challenge. When we inebriated, our sense of right and wrong can be skewed. We tend to take more risks, be bolder, and do stupid things. Talk about the dangers of participating in a dare and bring up drug and alcohol use. Teens are exposed to these elements, so don’t forget to mention the danger and impact on taking a dare while intoxicated. No, I am totally cool. I need to stay focused on getting into college, or keeping my scholarship. Yeah, this is really not my thing. No, I am not scared, I just don’t want to end up in jail or in the hospital. I can find 100 other things to do, rather than this. I am not bored enough to be that stupid. Practice the different scenarios so they can seen how peer pressure plays out and how they can keep their power and say no to their peers. Reminding the teens the difference between fiction and reality. It might sound silly, but they often are so wired that they forget that in their real world, this can be dangerous. Have them list 3-5 people that support them. It is their Buddy list. It will help when they need to find support or validation to overcome the rejection or backlash of not caving to peer pressure. These are some examples and ideas to help you navigate the latest idiotic trend. Make sure you do address the movie and peer pressure. You want to know that your child is aware of what is going on and the consequences.